Lee & Low Books, 9781600602412, 48pp. Young Mekhai, better known as Bird, loves to draw. With drawings, he can erase the things that don't turn out right. In real life, problems aren't so easily fixed. As Bird struggles to understand the death of his beloved grandfather and his older brother's drug addiction, he escapes into his art. Drawing is an outlet for Bird's emotions and imagination, and provides a path to making sense of his world. In time, with the help of his grandfather's friend, Bird finds his own special somethin' and wings to fly. Told with spare grace, Bird is a touching look at a young boy coping with real-life troubles. Readers will be heartened by Bird's quiet resilience, and moved by the healing power of putting pencil to paper. 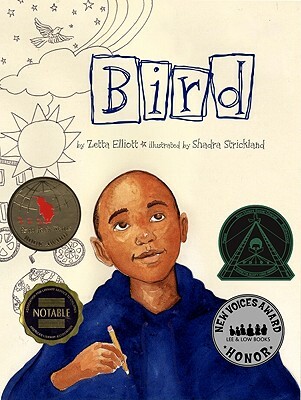 Bird, the recipient of Lee & Low's New Voices Award Honor, is the first picture book of both Zetta Elliot and Shadra Strickland.